I’ve been in some meetings that I couldn’t wait to end. I’ve led a few myself. #1. Kind candor and courageous transparency abound. Courageous transparency and kind candor transform any meeting from run of the mill to exhilarating. The worst meetings are filled with political posturing, head-nodding, and brown-nosing. Give me a meeting where someone says, ‘That doesn’t feel right,’ over meetings filled with fake smiles. The person who speaks their truth in front of others is the bravest one at the table. Honor it. #2. Options, not easy answers, are developed and explored. Shallow meetings – filled with politically correct answers – waste talent and time. When someone raises an issue, develop four or five possible options. Say, ‘And what else?’ after the first or second responses. #3. Many participate; few observe. The fewer observers and more participants in a meeting the better. Eliminate anyone from the meeting list who doesn’t make meaningful contribution after three meetings. #4. Conversation happens around the table. If you’re leading a meeting, help participants talk to each other. Nod and look around for input, after someone speaks. Don’t add your two cents after each person talks. Bob, we haven’t heard from you in awhile. What’s going on in your thinking? Mary, what do you think about the issue Fred raises? #5. Shorter is better than longer. Enthusiasm is part anticipation. Brevity gives permission to anticipate the next meeting. A series of long boring meetings makes you dread the next one. Start your next meeting by saying, we’ll be done at quarter till instead of the top of the hour. What happens at the best meetings you lead or attend? How might you put some of these ideas into practice? #1 is critical and the leader has to lead when it comes to candor. When you come to a meeting you need to know why you are there. If you can’t contribute, don’t go. If you’re the leader and the only purpose of the meeting is that you have one every week, cancel them. When you leave a meeting you need to know what to do next. What will you do before the next meeting to make it even more productive. 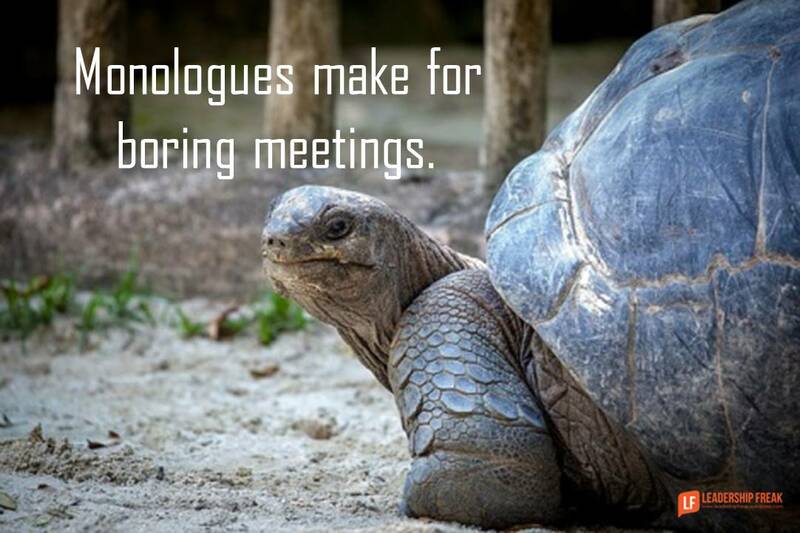 Too often meetings just repeat the discussions from last time. To sum up: 1) Be kind but candid. 2) Know why you came. 3) When you leave, do what was decided and 4) Don’t only try to make the meeting shorter, make meetings fewer! Working through a transformation at the moment. Inherited Owners that are used to micro-managing and making all decisions and a team that are used to being told what to do. Top this off with a blame culture and it’s a low starting point. Making progress with removing blame culture, educating on accountability and responsibility, teaching about leading teams, and gaining trust from owners that not all decisions need to be made by them. Thank you for another timely article, I always enjoy reading these! I typically get good feedback from the meetings I run but I’m always looking for ways to improve them given the diversity in the teams I work with, and today’s article provided some insight as to where I’ve become complacent and where I can make some changes. Rule #3 really spoke to me and I’m going to expand that one to myself. For example, if I’m not participating in meetings/forums, or can’t say why I’m there, I’ll stop attending. I also have a question: do you have some thoughts on how to stop the monologues? I run a few meetings where one or two people tend to talk over everyone else. The people are often the most knowledgeable so they are the ones other teammates defer to, which is counterproductive to the meeting and frustrating to those who have to sit back and wait for the speakers to take a breath in order to get a word in. Meetings, when they can, should be facilitations of ideas and not simply dissemination of information. There are Zillions of ways to do the latter without having to hold a meeting. And I once fired a client when his company leadership culture was so bad that people would send their secretaries to the meeting room to see if anyone else in the meeting was there yet. Nobody wanted to be first and everyone wanted to be last and some scheduled meetings never actually too place., even when called by the CEO!! Today, I guess they could simply install their own wireless cameras in the room, right? Best meetings for me have some overall agenda, some desired outcomes, and a good bit of active interaction and discussion. I would say all these traits are good for meetings. The job of the leader then is to use a meeting format that allows and encourages these traits of a great meeting. I ask for a rating at the end of our meetings 1-10 and have maintained between an average between 7-8. Our structure for every weekly meeting is the same. I’ll share it here. 5 min. Segue into meeting with a personal and business win for you, everyone has the opportunity. we go around the room. 5 min. Scorecard review – everyone has a metric to share that they track through the week. 5 min. Customer / Employee headline – Everyone has opportunity to give a shout out for exceptional performance or attitude (and sometimes it’s necessary to highlight exceptionally poor performance or attitude – this adds to our issues list). 45 min. We identify, discuss, and solve problems from a list picking the top 3 priorities for this week, new weekly to-do’s come out of this. I didn’t create this format, our company is grateful I found and adopted it! Have a great meeting this week!